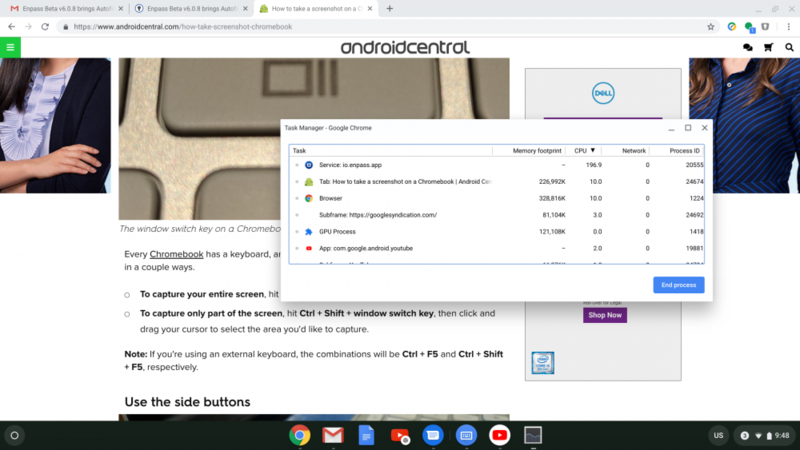 Autofill support in Chromebooks: Say howdy to all new Enpass Password Manager extension for Chromebook which makes filling details in Chrome browser easier than ever. Install the exclusive beta extension from here http://bit.ly/2TKsq0Q and share your experience. App Shortcuts: Introducing the App Shortcuts in Enpass and making it easier for our beloved users to Search, Add or access Favorites items quickly. Users can reveal the shortcuts by long-pressing the Enpass app's launcher icon avoiding the need for additional navigations. Better Dark Mode: Bringing the true Dark mode to the Enpass app and making it easy on the eyes. Fast Scrolling: The app now keeps the scrolling smooth for the lists of content, by offering the Fast Scroller. It allows you to drag a scrollbar to scroll to wherever you wish quickly. Fixed an issue where the text got truncated in the Greek language. Get your hands on this beta version and share your valuable feedback. If there are other improvements you’d like to see, please leave a comment below. Hallelujah! Just signed into the Enpass forums using it. I've been going absolutely nuts trying to do this in the past on a Pixel Slate which, when no keyboard or mouse is attached, acts as a tablet and not a clamshell so the enpass interface took over the entire tablet and not just as a window. So far, so good. One thing that I noticed: when Enpass locks due to inactivity after using it, the window pops back up (Clamshell mode for ChromeOS; haven't yet seen it do this on Tablet mode). Minor annoyance, but it literally interrupted me as I was typing this. Any way to stop it from popping up when it locks? Still no real windows hello support... After 4.5 months... When is that coming? Thanks for bringing this to our attention. The issue has been shared with the dev team, and we will try to resolve it in the coming update. Unfortunately, we do not know of an ETA we can provide for you as there is a user interface issue in Windows Hello dialogue when used in Win32 apps. We are in talks with Microsoft Hello team regarding it, but there is no apparent fix soon. We thank you for your patience and understanding. Hey! Finally the chromebook extension, thank you so much, but there is one problem I have with it: I can't set a shortcut to autofill automatically.. With the "default" enpass chrome extension I can set an own shortcut and enable "autofill without showing the enpass assistant" - and bam, I only need to press my shortcut to autofill. And I've found a bug if you want to say so: When I start my chromebook and click on the extension to autofill, I'm asked for the password and when I typed it in, I get the list with all my entries and not just the entries for this specific website.. I need to close and open the extension again to finally only see the entries for this specific website! You can see that it's not fully visible, but I can't scroll down to see the complete card! Many thanks for your valuable feedback. All the issues have been noted and shared with the QA for further investigation. I appreciate your patience while we work through this. Open Google Play Store on your Chromebook > Search and click Enpass > Scroll down > tap Join under the Join the beta. Wait for some time to get the changes and update reflected in the Store. You need to opt in to the Android Beta of Enpass. Just go to the Enpass Page in the Play Store, there you can find a button to opt in. Now download Enpass via the Play Store on your Chromebook and the Beta extension linked above and enjoy Enpass! One more feedback: Sometimes, when I wake up my chromebook I get a connection error website from the enpass extension, there I can just wait a few sec longer and it automatically disappears or I click on connect. Maybe you could let the extension wait a few sec longer before opening this error page? It's currently annoying, at basically every restart of my chromebook I get this error page for 3-4 sec.. I am seeing Enpass Extension or Service on my Chromebook peg my CPU very hard. I am guessing the task manager shows percentage of CPU load per task. It shows Enpass hitting my CPU between 250-350%? When it is like that my estimated battery life goes down to 2hrs from a full charge, and once I kill the task my battery life goes up to 5-6hrs. I have tried uninstalling and reinstalling, same results, though not right away. Overnight the behavior came back. Oh god, I'm not the only one! I was wondering why my fan is so loud since some days, now I realised that it's Enpass and I wanted to report it here right now, and saw your comment! Especially when I wake up my Chromebook from suspend, my fan is spinning at 100% for ever, because Enpass is using 100% of the CPU for ever, if I don't reboot my Chromebook! And the Chromebook is getting really really hot! @Vikram Dabas Please fix this fast, the other bugs are just small ones but this one hurts the battery very hard and it's also not great to have my fan's spinning at 100% for ever after suspend..
Edit: I noticed that after I switched off my WIFI the enpass app was instant at 100% and I needed to force close it. So you're telling me that it's Microsoft's fault that I need to use my Master Password once after restarting and never again thereafter? I'm sorry, but that sounds like the usual lame excuse people give when an app doesn't work: "it's Microsoft's / Windows' fault". It always is. It isn't, It's your fault. You took an awesome product (Enpass V5 UWP) and broke it by abandoning UWP and moving to Qt. Too many long standing, loyal users all over the store and this forum are frustrated as he*l. New customers never knew Enpass V5 so they don't realize what was lost. You spent about a year in beta, so assuming you knew Hello didn't work with Qt, you went ahead with the platform anyway, knowing it was broken. Most other leading password managers in the store don't seem to suffer from this problem. Oh, wait - most of them are universal! I forgot. And somehow, they also managed to build browser extensions too. And support other platforms. C'mon … how hard can it be? Thanks for taking the time to let us know about this. It is undoubtedly an issue out of the norm that we'd like to address ASAP. It has already been shared with the QA team, and they are currently investigating it. I will be in touch as soon as I get an update from them. Till then I appreciate your patience and co-operation.